Brennan, Matthew. 1987. Wordsworth, Turner, and Romantic Landscape. Columbia, South Carolina: Camden Press. Burke, Edmund. 1756. Philosophical Inquiry into the Origin of our Ideas of the Sublime and Beautiful. Gilbert-Rolfe, Jeremy. 1999. Beauty and the Contemporary Sublime. NY: Allworth Press. Gilbert-Rolfe, Jeremy. October 30, 1999. Speech given at Manchester Metropolitan University, New Painters Conference, Liverpool, UK. Hunt, John Dixon and Peter Willis (eds). 1975. The Genius of the Place: The English Landscape Garden 1620-1820. London: Paul Elek Ltd.
Kelly, Michael (ed). 1998. Encyclopedia of Aesthetics. Volumes 1 and 4. NY: Oxford University Press. Ketner II, Joseph D. and Michael J. Tammenga (co-curators). 1984. The Beautiful, the Sublime and the Picturesque: British Influences on American Landscape Painting. Washington University Gallery of Art, St. Louis, Missouri. Moore, Leslie E. 1990. Beautiful Sublime: The Making of Paradise Lost, 1701 – 1734. Stanford, California: Stanford University Press. Ross, Alexander M. 1986. The Imprint of the Picturesque on Nineteenth-Century British Fiction. Waterloo, Ontario, Canada: Wilfrid Laurier University Press. Smithson, Robert. 1979. “Frederick Law Olmstead and the Dialectical Landscape,” The Writings of Robert Smithson: Essays with Illustrations, NY: NY University Press. The meaning of "the beautiful" and "the sublime" as an aesthetic lingual duo is rooted in discourses on language, nature, literature and visual art. Before delving into the meaning of the terms together, it is important to lay out the relevant definitions of each term individually. The Oxford English Dictionary defines "beautiful" as "(1) excelling in grace of form, charm of colouring, and other qualities which delight the eye, and call forth admiration, (2) affording keen pleasure to the senses generally, (3) impressing with charm the intellectual or moral sense, through inherent fitness or grace, or exact adaptation to a purpose, and (4) relating to the beautiful; æsthetic." The OED defines the adjective "sublime" (in terms of "things in nature and art") as "affecting the mind with a sense of overwhelming grandeur or irresistible power; calculated to inspire awe, deep reverence, or lofty emotion, by reason of its beauty, vastness, or grandeur." When these definitions are applied to the relationship between "beautiful" and "sublime," they can be boiled down to the following: being pleasing to the senses in some way (beautiful), and evoking an overwhelming loftiness or vastness, either in ideas, art, nature or experience (sublime). This is, of course, simplifying terms that have been so hotly debated in philosophical circles for hundreds of years. However, for the purposes of illuminating their relation to each other in the broader field of theories of media, it is necessary to compare them on a fundamental level. According to the Encyclopedia of Aesthetics' chronicling of the origin of "sublime" as it relates to aesthetics , "The sublime was routinely coupled with the beautiful to produce a classificatory system for judgments about experience." (Kelly, 1998, vol. 4, 327) The discussion of the sublime in aesthetics is rooted in a treatise written by Longinus, of the first century C.E. (ibid, 326) The treatise was devoted to an analysis of styles of rhetoric, and introduced the notion that there could be something surprisingly (or unintentionally) artistic about the rhetorician's performance. This notion of the intention or motivation of the author or artist received further analysis later by Immanuel Kant in the discussion of the sublime as it related to aesthetics. Though before Kant, Edmund Burke wrote an "enquiry" about the relationship of the sublime to the beautiful. Edmund Burke's conceptualization of the beautiful and sublime is split into fairly distinct categories. In his Philosophical Inquiry into the Origins of our Ideas of the Sublime and the Beautiful (1757) , Burke categorizes "objects of experience" by the way in which they impact the senses (Kelly, 1998, 4, 327). Burke associates qualities of "balance," "smoothness," "delicacy" and "color" with the beautiful, while he speaks of the sublime in terms such as "vastness" and "terror" (Burke, 1757). For Burke, the terms work almost in opposition to each other; the sublime is certainly not part of the beautiful in the Burkeian world. Other thinkers debated Burke on the notions of these categories. After an initial similarity to Burke in 1763, Kant later argued against Burke's Philosophical Inquiry, highlighting the difference between the sublime and the beautiful in his Critique of Judgment (1790) by applying the sublime aesthetic to nature only. In doing so, he illustrated the way in which the natural sublime "provided a pure instance of aesthetic judgment," because there was no "artist" of nature - meaning there was no intention of the artist to interpret when judging the object (Kelly, 1998, vol. 4, 327). The natural sublime removed the original intent of the author or artist as a factor in judging the "aesthetic power" or value of the object (ibid, 326). Kant's natural sublime was determined by a subjective judgment; it was a response that treated something that "was not produced to be meaningful [to us] as if it were meaningful." (ibid) Kant claimed that the sublime aesthetic exudes a "purposiveness without purpose" that the Encyclopedia of Aesthetics says came to be "associated with the claim that sublime aesthetic experience contained within it a commitment to avant-gardism." (ibid, 328) It is precisely this sentiment - that the sublime aesthetic has an unintended effect on its receiver - that Kant's notion can be linked to both modern and postmodern art. As for the beautiful, Kant basically perpetuated the Burkeian notion of the term, likening (and extending) it to resemble truth, goodness and taste. Kant believed that beauty pleased "disinterestedly," but "universally" (Kelly, 1998, vol. 1, 241). The notions of beautiful and sublime as they relate to art are nestled within the history of eighteenth-century landscape painting, first British, and then American. When discussed on these specific terms, the pair becomes a triad that includes the term "picturesque." 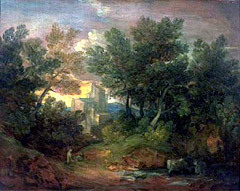 "Picturesque" serves as a sort of middle term to the previous two, and is rooted in the specific tradition of landscape painting. Travel author William Gilpin first defined the landscape term as expressing "that particular kind of beauty which is agreeable in a picture" (Watson, 1970, 19). The Beautiful, the Sublime and the Picturesque summarizes the history of the three terms as they relate to British and American landscape painting. It describes paintings in "the beautiful" tradition as containing "serene, calm landscape(s) consisting of idealized natural forms arranged in a balanced composition" (Ketner and Tammenga, 1984, 10). It is important to note the term "balanced" in this description, as it evokes Burke's notion of "the beautiful." Picturesque paintings depicted "rough, craggy trees and foliage, sharp contrasts of light and shadow, and rustic anecdotes" (ibid). The emphasis in these paintings was on "the variety and contrast of visible, rather than idealized, nature" (ibid). Finally, sublime painting is discussed in this way: "Terror and wonder engendered the emotional bases of a sublime aesthetic response to wild nature... Tremendous mountains, deep valleys, and cataclysmic storms...were typical subjects of sublime landscapes" (ibid). Burke's conceptualization emerges once again, in that terror and vastness are defining qualities of eighteenth-century landscape painting. British landscape painting in these styles also fed the tourism industry, leading to the creation of actual, physical landscapes (gardens and such) that matched the style of the paintings. This spillover from landscape painting into actual landscaping affected Romantic literature as well. For example, the themes of the beautiful and sublime are present in John Milton's eighteenth-century novel, Paradise Lost (Moore, 1990), as well as with the picturesque in the poetry of William Wordsworth (Brennan, 1987). Twentieth-century artist Robert Smithson discusses the notions of the beautiful, sublime, and picturesque in relation to landscaping in his article, "Frederick Law Olmstead and the Dialectical Landscape." Smithson situates landscape architect Olmstead's perspective of landscape in the traditions of eighteenth-century England. He discusses the way that Uvedale Price "extended" Burke's notion of the sublime and beautiful 'to a point that tried to free landscaping from the "picture" gardens of Italy into a more physical sense of the temporal landscape. A tree, for example, struck by lightning was something other than merely beautiful or sublime - it was "picturesque."' (Smithson, 1979, 118) Smithson later expands on this idea of the picturesque as something that is "far from being an inner movement of the mind" (as the beautiful or sublime may be), and "based on real land." This matches the description of the picturesque delineated earlier, in that it is the middle ground between the extremes of the beautiful and sublime - evoking a sense of reality of the landscape. Smithson's earthwork art, the Spiral Jetty, is arguably a depiction of "the picturesque," as it utilizes "real land," as well as impels the viewer to take a picture of it (as Smithson himself did with his documentary film of the making of his jetty). Artist, writer and critic Jeremy Gilbert-Rolfe has expressed a current view of the beautiful-sublime relation in his book, Beauty and the Contemporary Sublime, 1999. What is most revolutionary about Gilbert-Rolfe's perspective is his notion that the sublime cannot exist in nature today. He claims that the sublime can only inhabit, or be expressed by, technology - as technology is limitless and yet to be apprehended. Gilbert-Rolfe says that nature is limited and finite, and that the sublime requires the limitlessness of technology. Gilbert-Rolfe associates beauty with glamour and frivolity, as opposed to the "goodness" of the Kantian or Burkeian "beautiful" (Gilbert-Rolfe, 1999). Although it is unusual to attempt to apply the notions of the beautiful or sublime to the mass media, Gilbert-Rolfe's discussion of the sublime in technology makes the application a logical next step. What can be described as beautiful or sublime in today's products of a highly mediated culture? Why are the notions of the beautiful or sublime important in terms of the mass media? In order to speak specifically about how these terms might apply in this context, it is useful to employ an example of a media event for analysis. A recent example of a media event of great magnitude is September 11th , 2001. Media coverage of the World Trade Center attacks can arguably be seen as beautiful, sublime, and picturesque. First, "beautiful" seems to apply most appropriately to photographs of the towers pre-disaster, in their entirety. Still photographs are an oft-used technique of the mass media, and the way that they captured the man-made construction of the two majestic towers evokes the Burkeian notion of "beautiful" as smooth, or pleasing to the senses. (Other philosophers may disagree with this characterization of something man-made as being beautiful.) If "sublime" means something exalted, or simply of large grandeur, or high in the sky, and can be used to describe architecture (among other things), it is also fair to describe the former World Trade Center towers as sublime. Conversely, it seems the connotation of sublime that refers to something so vast, so great, it is almost terrible in its greatness, could also be used to describe the falling of the World Trade Center towers. Does this mean that we can describe the experience of watching the news media coverage of this event as "sublime"? It seems the answer would be yes. One felt terror and the vastness of the event while watching the live coverage on television. Gilbert-Rolfe's association of the sublime with technology applies here as well. His notion of the sublime accommodates the proliferation of high-tech "news crawls" scrolling across television screens during 9/11 coverage, enabling viewers to have constant multi-media access to news updates while simultaneously watching the giant buildings fall over and over again. The moment each plane crashed into the buildings represented the rupture in the beauty - evoking both "the real," and maybe even the picturesque (in the sense of something ragged interrupting a scene, or simply in the sense that one - or in this case, many - felt compelled to take a picture of the ripped-through buildings). Alexander Ross (1986) best captures an important element of the picturesque - and its blending of the beautiful and sublime - when he says of William Gilpin, "Gilpin's theorizing sometimes brings the real and the ideal into contrasting relationships." (Ross, 1986, 7) Ross' analysis pinpoints the importance of the beautiful, sublime and picturesque to students of media theory; in that the terms have been used to evoke various levels of "the real" and "the ideal" in philosophy, art and literature. The categories have been used in an attempt to identify the effects of nature, art, and language on one's senses, as well as to establish ways in which to discuss values of art. The tradition of aesthetics was borne out of lengthy discourses on the meaning of the beautiful and sublime. On the most fundamental level, the long discussions of the meaning of the beautiful and sublime were aimed at trying to accurately capture in language a description of one's experience of a thing. As a central activity of most media and mediums is to shape or communicate experience, the relationship between the beautiful and sublime is one that is perennially important to students of art history and broader theories of media alike.